Artwork description & Analysis: Höch's darkly playful Dada Dolls are quite distinct from any work created by the others in the Berlin group of Dada artists with which she was affiliated early on. Given that the Berlin chapter of Dadaists only formed in 1917, these small-scale sculptural works suggest her awareness of Dada ideas more generally from its inception in 1916 in Zurich. She was likely influenced by writer Hugo Ball, the Zurich-based founder of Dada, given Höch's doll costumes' resemblance to the geometric forms of Ball's own costume worn in a seminal Dada performance at the Swiss nightclub Cabaret Voltaire. Artwork description & Analysis: Heads of State is built around a newspaper photograph of the German president Friedrich Ebert and his Minister of Defense, Gustav Noske. Having carefully cut the men out, Höch proceeded to create a composition with characteristically disjunctive and unexpected outcomes. The two statesmen look decidedly foolish out of context in their bathing suits, and Höch places them against a background of an iron-on embroidery pattern of flowers and butterflies surrounding a woman. At this point, in time she was still working for magazines designing similar patterns, and this work is testament to her ability to converge her disparate experiences to create new and striking images. 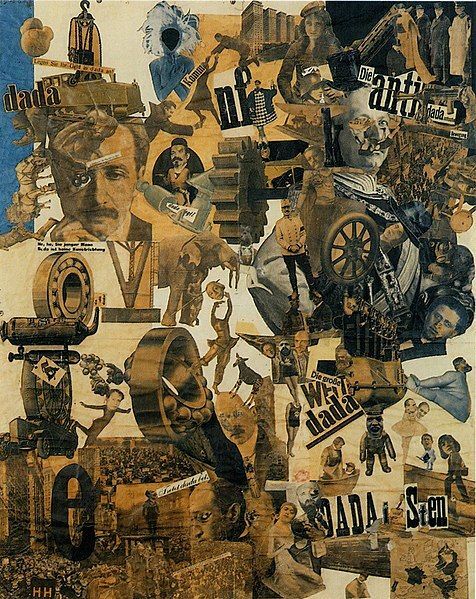 Artwork description & Analysis: Though one of Höch's earliest works, this ambitious collage is unusual within her canon for being particularly large; it measures 35 x 57 inches. Here she uses cuttings from newspapers and magazines to create one cohesive image out of a myriad of disparate parts. This technique of taking words and images from the established press to make new and subversive statements was highly innovative. Artwork description & Analysis: Höch's High Finance is a perfectly composed example of her innovative photomontage technique. The viewer is presented with two banker figures, each with a disproportionately large and mismatched head, one of which is a photograph of 19th-century British chemist and astronomer Sir John Herschel. 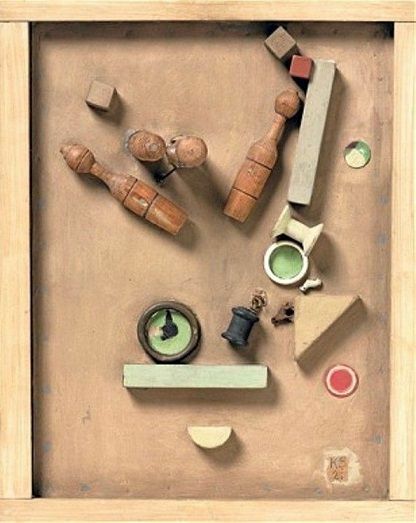 The effect would be comical, were it not for Höch's intelligent arrangement of the other visual elements. One of the bankers' heads is spliced cleanly in half, and behind it are two shotguns, which look as if they are simultaneously being aimed by and at the banker. Artwork description & Analysis: This work comes from a series of images made by Höch around 1930. They are said to have been inspired by a trip to an ethnographic museum with her partner Til Brugman. The image makes powerful use of tropes of display, such as the clear framing border, the expansive sea of the red color-field background and the blue rough semi-circle that acts as a plinth for the central figure. Artwork description & Analysis: Much of Höch's post-Second World War work is little-known and unacclaimed. However, Industrial Landscape is one work that escaped this status. Here, Höch uses her scalpel with exceptional skill to create a very complex image. 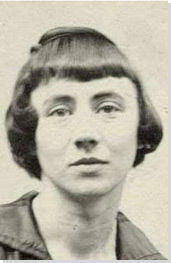 Her work in this era was typically characterized by a new approach to her appropriated materials: rather than taking them as they were and putting them in surprising contexts, she started to transform her newspaper and magazine cuttings with her scalpel until they bore little resemblance to their original forms. 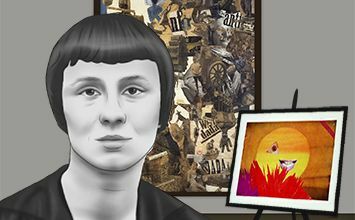 Artwork description & Analysis: Lebensbild or Life Portrait is Höch's last work, and a fitting end to her career. It is a photomontage containing multiple images of the artist herself, always sporting her characteristic severely bobbed hair, which made her an emblem of the "New Woman" in her youth. In this unusual self-portrait of sorts, she revisits several themes that she had explored over the course of her career, including fashion templates and patterns, African sculpture and decontextualized images from newspapers. She also makes use of imagery that concerned her later in her life, such as that especially of nature, of plants and animals.